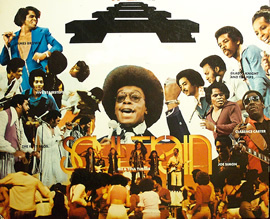 Performers include: Don Cornelius, Mystro Clark, Shemar Moore, Dorian Gregory, Pat Davis, Albert Ebbs, Andrea N. Miles, Vicki Abercrombie, Diana Thompson, Lina So, and Sid McCoy. This African American-oriented variety program is the first of its kind on American television. Each episode features musical performances by rhythm and blues, soul, and hip hop artists, as well as appearances by guest hosts, and dance numbers by the show’s dancers. Artists featured over the years have included Gladys Knight & the Pips, B.B. King, Al Green, The Four Tops, Ike and Tina Turner, The Jackson Five, The Temptations, Aretha Franklin, Marvin Gaye, Michael Jackson, The Pointer Sisters, Elton John, Barry White, David Bowie, Kool & the Gang, Donna Summer, The Beastie Boys, New Edition, Luther Vandross, New Kids on the Block, Milli Vanilli, Salt-n-Pepa, Run D.M.C, Paula Abdul, MC Hammer, Lil’ Kim, and P. Diddy. In addition to musical performances, there are regular segments like the “Soul Train Hotseat,” in which artists are interviewed by the show’s dancers. In “Soul Train Scramble Board,” two dancers are given one minute to unscramble a board of random letters — often spelling the name of that show’s performer or the name of a famous African American in history. Each program typically ends with the show’s dancers forming two separate lines across from one another, otherwise known as the “Soul Train Line.” Each dancer struts down the length of the line to showcase their trademark moves. The series was created by Don Cornelius and he hosted the program for most of its run. Other hosts have included Mystro Clark, Shemar Moore, and Dorian Gregory. hey what’s happening? this is Rick from orr high school,founder of dance master the number one dance group on Soul Train in Chicago WCIU channel 26 you know what I’m talking about. i saw this write up on my tablet. you get a chance give me a buzz man. also saw Michael Gardner on here. Louisville,Kentucky PD gave us the Muhammad Ali when an officer taught him to fight. Just to show thanks for things had and lost last year. …wut? Are you saying while in lockup, the PD gave you the opportunity to watch the Muhammed Ali episode? I was a dancer on the Chicago soul train on channel 26. We had a dance group called the dance masters. There was another group called the puppets. Boy they were good dancers. We had alot of fun back then, it’s just bothers me that there is no footage from back then. I also am an ex soul train dancer ( boy those were the days) I miss don Cornelius his genius generated one of the hottest dance shows in American history soul train will never die it is remembered all around the world,everybody knows the soul train line and all the great performers that got their exposure.RIP Mr Cornelius you and soul train will always have a place in my heart. Never will be another long-running music series like it. (No disrespect to “American Bandstand.”) Tribute to the late Don Cornelius for pioneering and producing this gift of R&B musical, and Black-American, history and culture. It’s a disgrace that no TV network has shown the entire Soul Train series of 35 seasons and over 1,100 original episodes spanning from 1971 through 2006. “BounceTV” does air some of the ST shows, but they keep repeating the same miniature sample of these programs, and not the entire series in its totality.